Gwynne Phillips and Briana Templeton (AKA. 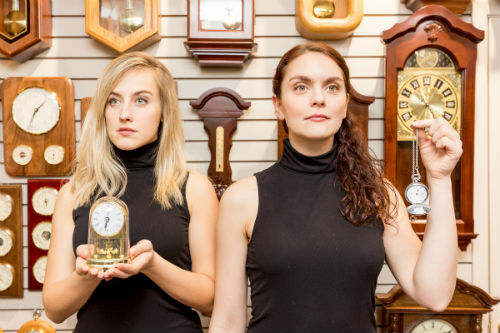 The Templeton Philharmonic) are no strangers to the Toronto Fringe scene, opening with a sold out show, all—as the title suggests—About Time. I was personally delighted to witness the duo for the very first time, having always heard great things about them, but never getting the opportunity to actually see their shows in the past. The great show that I was promised was delivered. And at the end of a five-show day, I was completely in love with all the characters and the variety of scenes they played out in a single hour. I really loved the small cameo appearances of Thom Stoneman, who got to throw in a few comedic beats and quips for those scenes that needed an extra person. He got a chance to win the audience over with a brief breather interaction scene, breaking the forth wall to build in a collective time capsule, collected before the show started. But of course, the stars of the show shone brightly. They even adjusted to a wonky sound cue by improvising ‘the band sometimes…’ in character while leading into the next scene. Templeton and Phillips are truly endearing performers, and they never seized to surprise me with each new character. My two favourite scenes included one about two English women having tea and consistently throwing in sexual innuendos, only to reveal how truly horny and undersexed they were in their marriage. My second favourite was a parody of The Sound of Music where Maria basically cracks under insanity. I’m still chuckling just thinking about it. There was something hilarious in every sketch. If it wasn’t in the writing, it was in the commitment the actors brought to each scene. I ended up sitting in between two women who weren’t laughing much, and I wasn’t sure if it wasn’t their personal cup of tea, but it surprised me because I couldn’t find anything about the show I didn’t enjoy. The special light of a clock they had for the transitions really brought the whole piece together, as well as the aforementioned narrator who moved us into each sketch and kept the story going. It’s not always the easiest thing with a sketch show, making all the scenes flow together seamlessly, but it really showed off just how talented and intelligent the writing was. I would make sure to get your tickets to this comedic wonderment soon. Especially if you’ve seen a Templeton Philharmonic show in previous years. You will not be disappointed. Content Warnings: Realistic Violence or Gore, Sexual Content, Fog, Mist or Haze Effects, Mature Language. Photo of Gwynne Phillips (left), Briana Templeton (right). Photo by Shannon Laliberte.